I’ve noted in previous posts that IKEA is often a very nice place for a wargamer to visit, so here’s my third instalment of Bless those Swedes (see here and here for the previous ones). As a result I can shoot fairly nice pictures using my old pocket camera, spending very little time on colour correction and achieving lovely, even lighting. The shade at the lower edge was caused by the camera itself due to poor positioning. The wires are neatly hidden behind the separate bottom plate of the box, and there’s a convenient hole in the back for the power cord. All in all this cost me 25 euros, which isn’t a bad price. 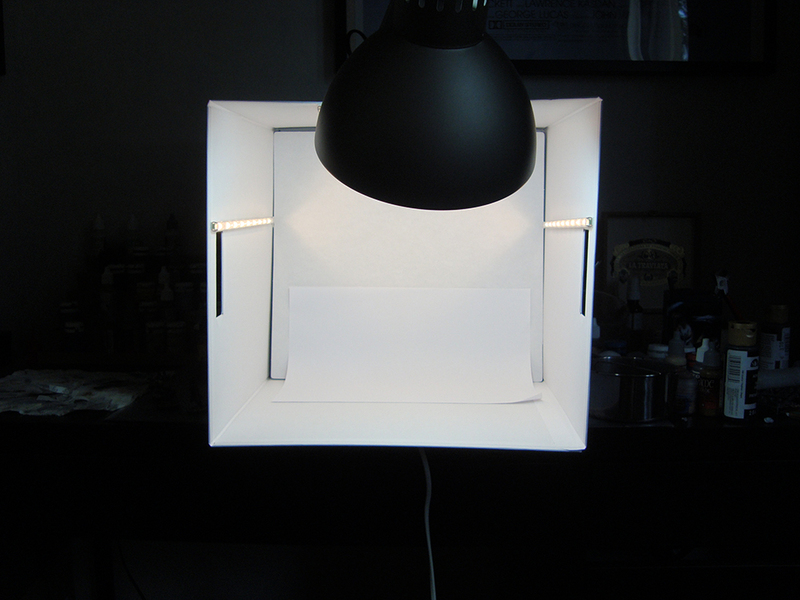 If you’re looking for a lightbox on the cheap, this might be a way to go. Of course if you can pick up brighter, whiter led lights, all the better! While the difference in photo quality may not appear to be huge, the amount of time saved in post processing is very significant – a lot of my photos have needed a lot of tweaking in Photoshop to make them presentable. 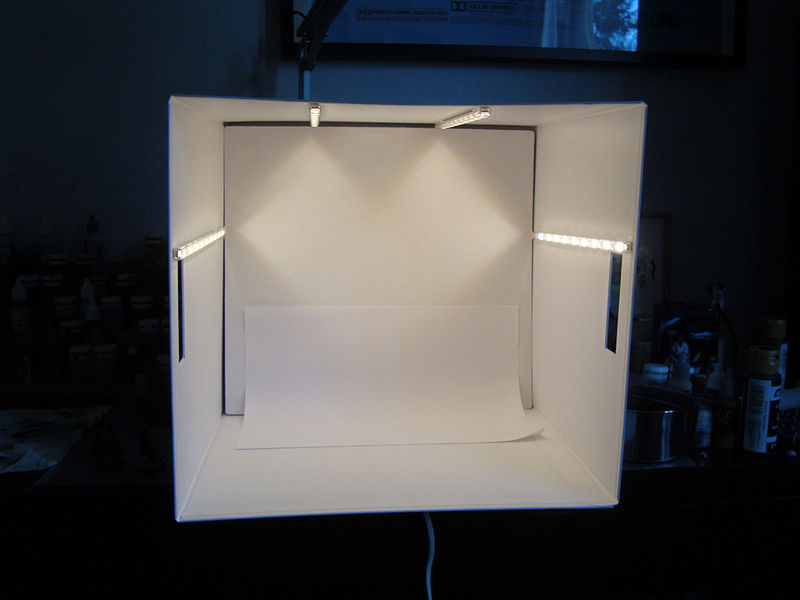 There you go, a lightbox on the cheap which took all of 15 minutes or so to make. Good enough for me! IKEA has some useful stuff for the modeller. Apart from the obvious, such as boxes, shelves and display cases (mine being a prime example), there are some useful items that are not immediately apparent. My latest trip to the Swedish house of wonders furnished me with some cork hot pads named HEAT as well as two colours (black and grey) of decorative sand under the name KULÖRT. 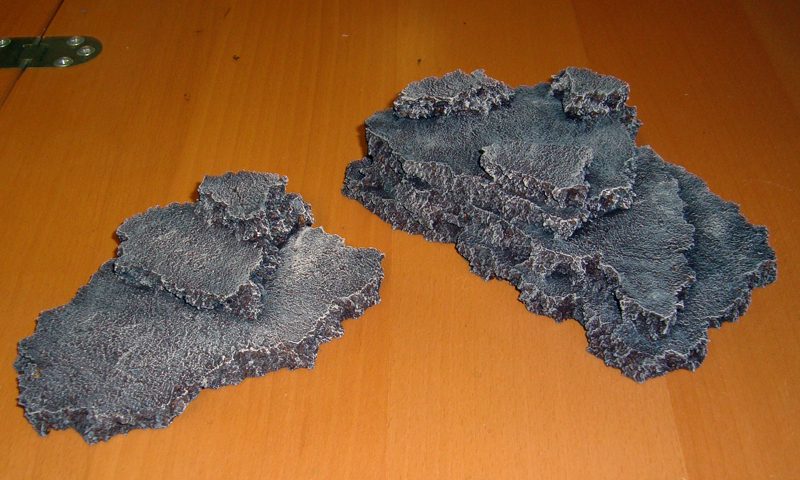 The sand will be used for basing, as it’s quite fine. There was a larger, coarser variety on sale as well. The hot pads are currently being turned into rock formations following the instructions in this thread on TMP. Below is a WIP picture as well as some finished ones. 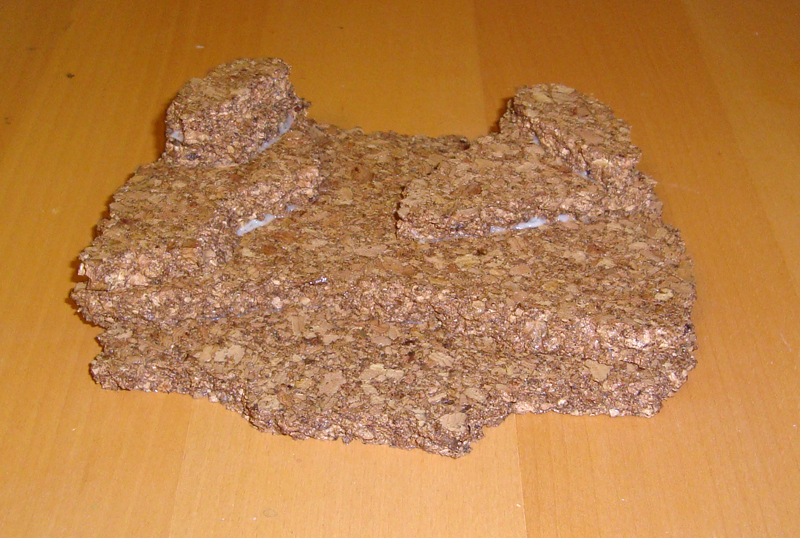 The rock formations turned out quite nice and they’re very easy to make. I’m looking to build a fair few for the next Utopia game, so I now have a pretty large stack of the IKEA hot pads waiting to be destroyed. So much fun! Oh my, over a month since my last post. That’s what the combination of summer holidays and Mass Effect 1, 2, and 3 will do to you. 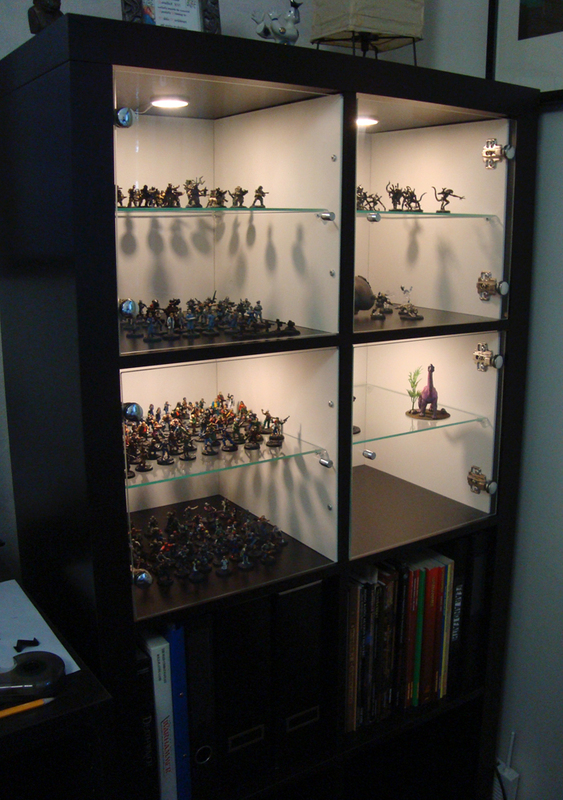 It has plenty of shelf space for both minis and rulebooks, and the glass doors – while an absolute pain to align – will keep dust out. The small LED lights installed in each compartment make it look pretty fancy, too! I’m going to add a few drawers to the two bottom compartments, but haven’t gotten round to building them yet. I love the spaciousness of it all: the picture shows the case with 150 miniatures or so, and they’re very loosely placed with one of the four compartments practically empty. With the blog coughing and spluttering itself to life again, expect to see a fair bit more activity than in the last few months. 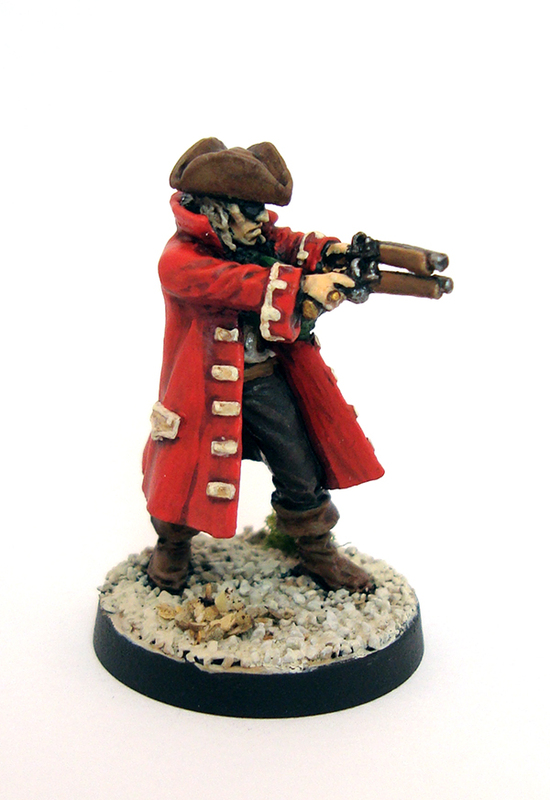 I have at least three review additions in the pipeline, plus I’m slowly getting started on painting the next minis for Utopia. Dear readers, it’s good to be back.